Scott Holland comes to you with a mission. To exceed your expectations by providing the best quality landscape maintenance service. His objective is to be the landscape maintenance leader in the area and to be recognized for quality, attention to detail, creativity and efficient delivery of professional landscape management services. 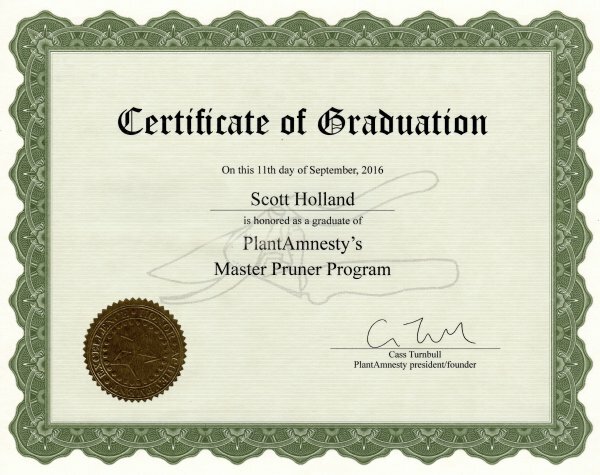 With over 25 years of experience, Scott believes in continuing education and has recently completed a Master Pruner Certification keeping him in step with the latest processes to keep your plants healthy. Scott began his education with an A.A.S. in Horticulture from South Seattle Community College in 1987. Furthering his education in 1995 he graduated with a B. S. in Plant Science - Landscape Horticulture from the University of Idaho and more recently the Master Pruner Course from Plant Amnesty Seattle Washington. Aesthetic Pruning of shrubs and small trees (under 15'), thinning, height reduction, shearing. Scott can also do simple landscape design plans for you.